Just call it a missed opportunity. 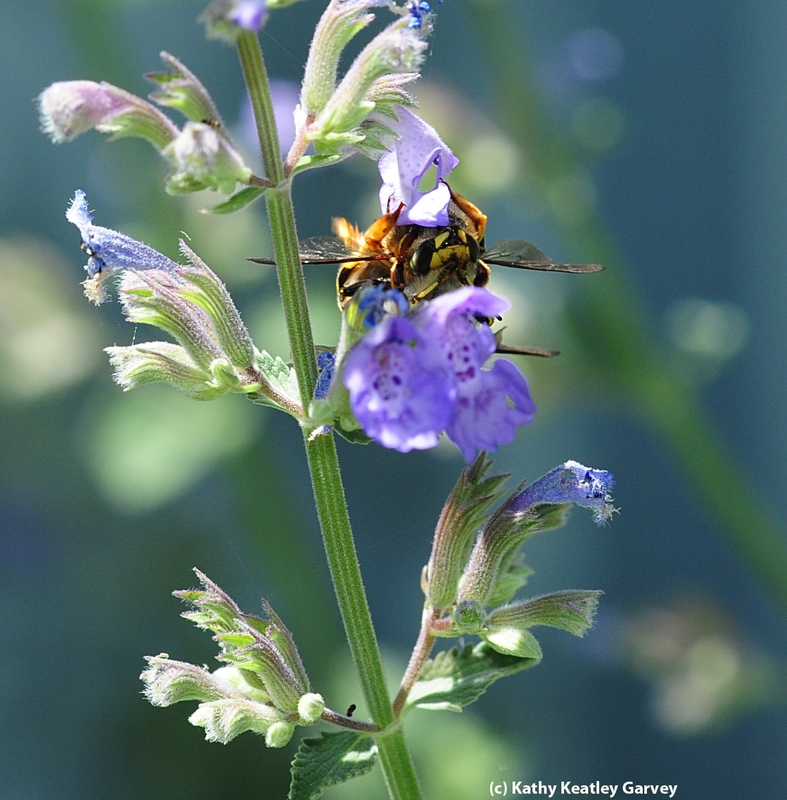 Catmint (genus Nepeta) draws scores of insects, from honey bees to leafcutter bees to European wool carder bees. 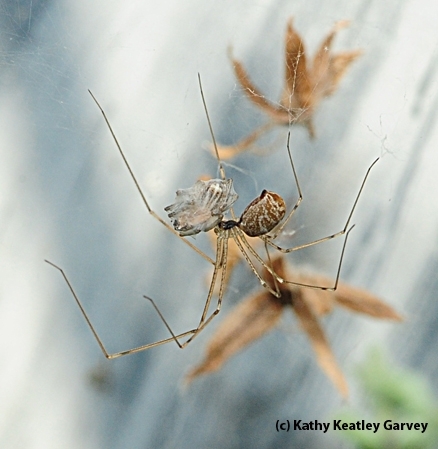 We usually see a cellar spider (family Pholcidae) trapping prey in its web. It inflicts a fatal bite and then wraps it for later consumption. 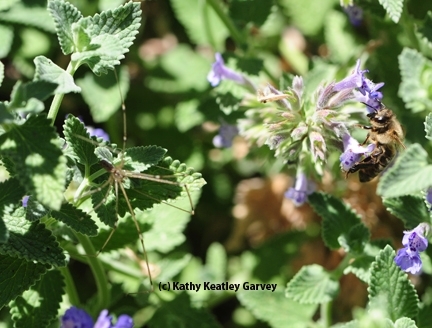 This cellar spider, however, crawled along a catmint stem to wait for prey. 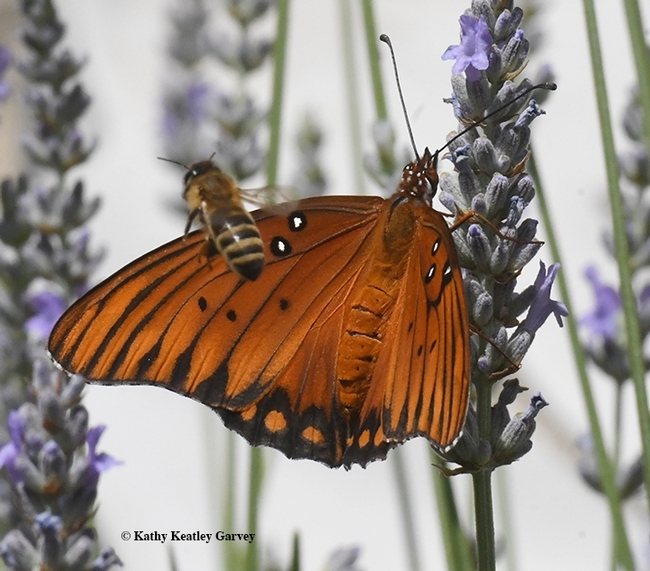 A honey bee buzzed down and began nectaring one of the lavender blossoms. It was not aware of the predator. 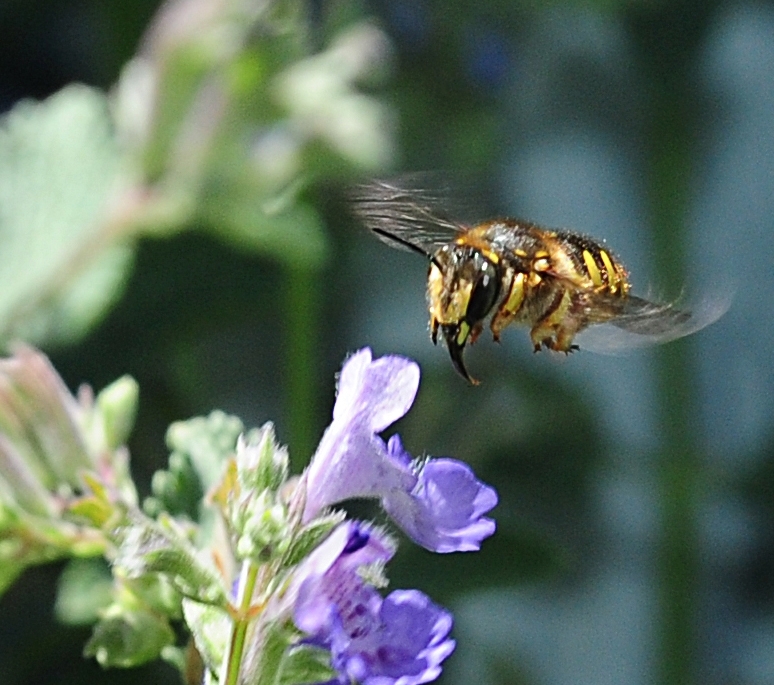 Just as the spider moved toward it, the bee took off. Later we saw the cellar spider wrapping prey. A closer look revealed it was not a honey bee, a leafcutter bee or a European wool carder bee. It was another cellar spider. Sexual cannabalism? Maybe. A very hungry cellar spider inept at catching a bee so it nailed a fellow spider instead? Perhaps. At any rate, that was "what's for dinner." 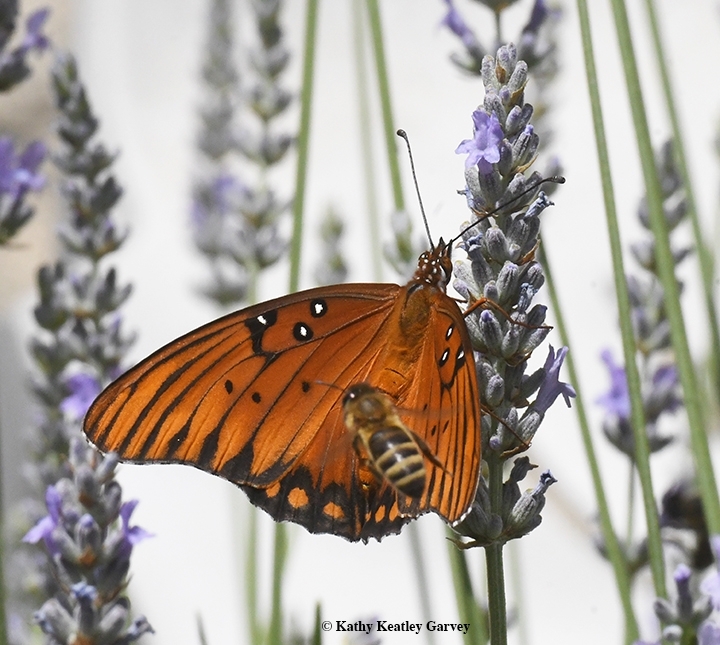 Its wings beat 230 times every second, according to Douglas Altshuler, a researcher at California Institute of Technology who co-authored research, "Short-Amplitude High-Frequency Wing Strokes Determine the Aerodynamics of Honeybee Flight," published in December 2005 in the Proceedings of the National Academy of Sciences. 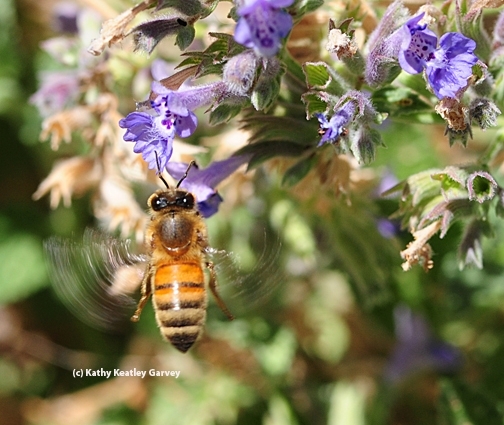 "The honey bees have a rapid wing beat," he told LiveScience in an interview published in January 2006. "In contrast to the fruit fly that has one-eightieth the body size and flaps its wings 200 times each second, the much larger honeybee flaps its wings 230 times every second." "And this was just for hovering," Altshuler said. "They also have to transfer pollen and nectar and carry large loads, sometimes as much as their body mass, for the rest of the colony." 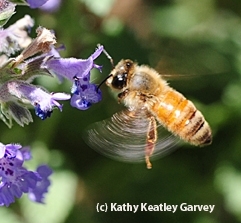 The Hive and the Honey Bee, the "Bible" of beekeeping, indicates that a bee's flight speed averages about 15 miles per hour and they're capable of flying 20 miles per hour. If they're not carrying nectar, pollen, water or propolis (plant resin), they'll fly much faster! Don't ever call the European wool carder bee (Anthidium manicatum) a slow poke. It's not "as fast as a speeding bullet" (Superman), but close. The males, quite territorial, chase away other pollinators, including honey bees, sweat bees and butterflies. 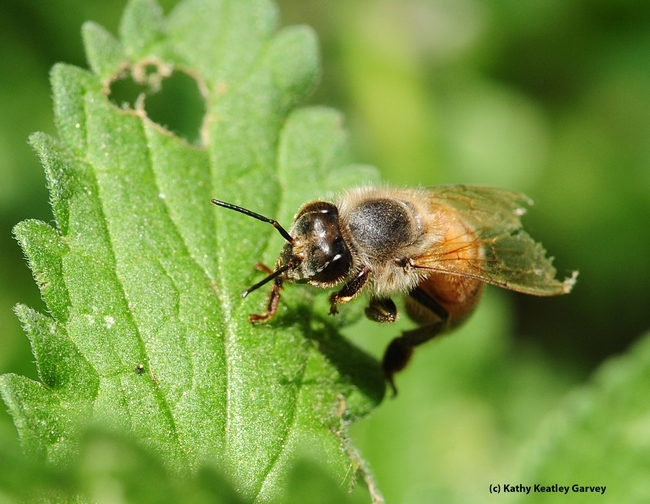 The European wool carder bee gets it name from the fact that females collect or "card" leaf fuzz for their nests. 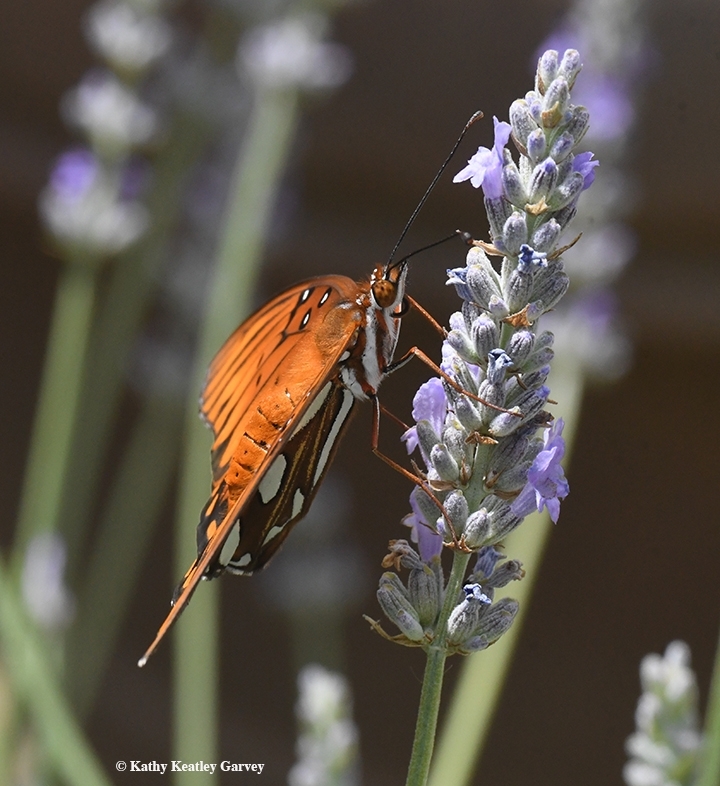 Today we watched the bees sip nectar from our catmint blossoms and mate. If you've never seen them in California, that's because they haven't been here that long. Originating from Europe, these bees became established in New York in 1963, and began spreading west. 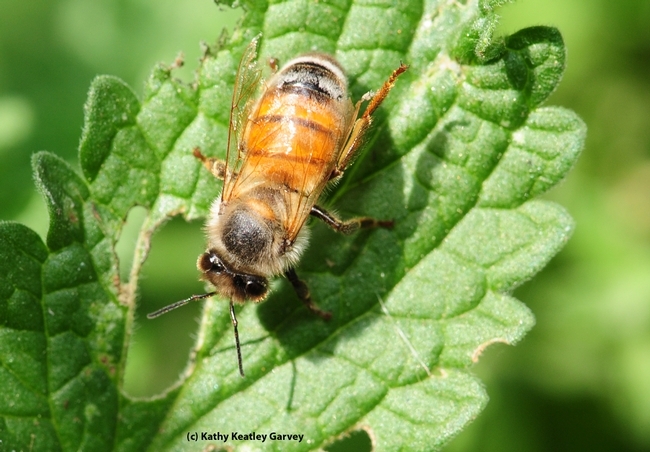 Bee scientists first recorded them in California (Sunnyvale) in 2007. Like to attract them to your yard? 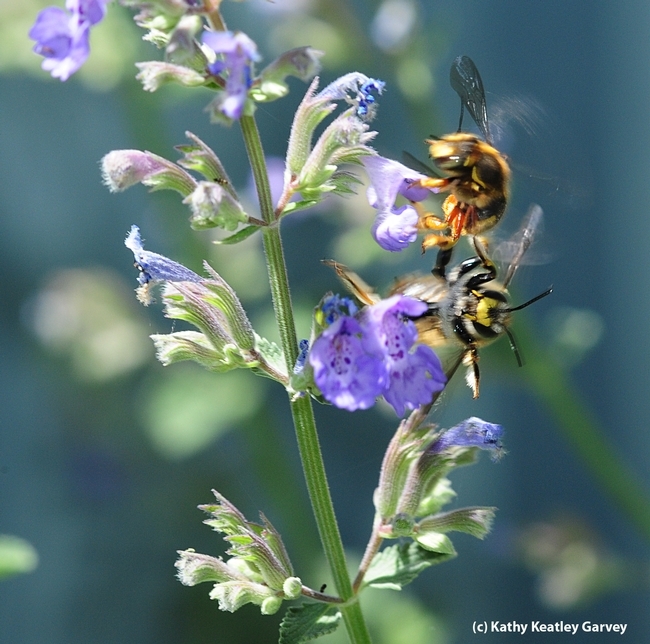 Plant lamb's ear (Stachys byzantia) and catmint (Nepeta). 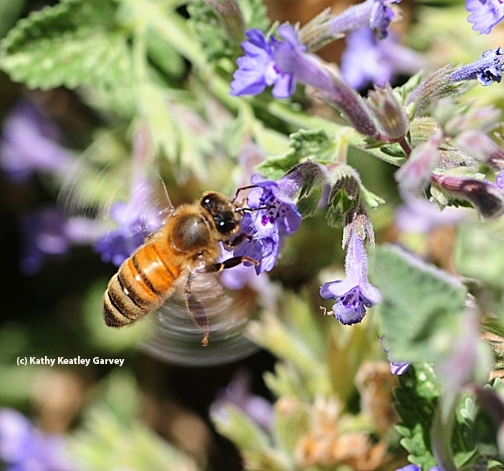 A honey bee tumbles off the flowering catmint (Nepeta) and struggles to right herself. Her wings tattered, her body battered, she does not buzz away. Perhaps she is approaching the end of her six-week lifespan--three weeks working inside the hive and three weeks working outside the hive. Bee scientists say that worker bees literally work themselves to death. 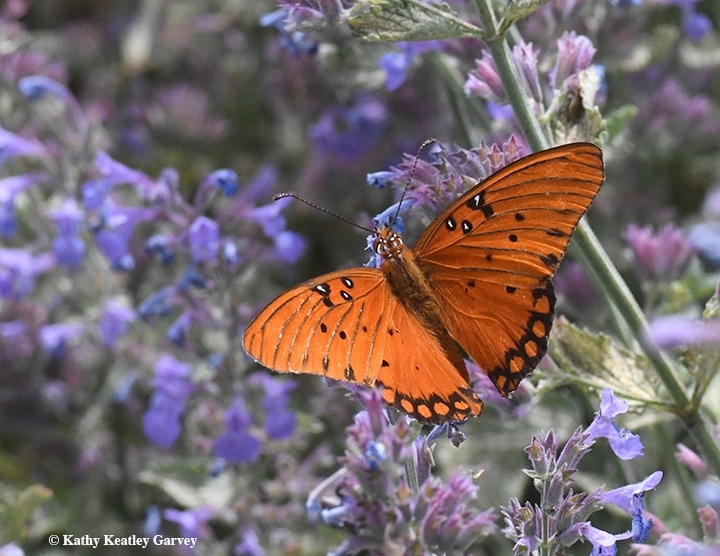 As a forager, she likely made about 40 trips a day gathering nectar and pollen. Forty trips a day. It's like going to the grocery store 40 times a day. Oops, forgot something. Got to return to the store. Bees can forage from a distance of up 5 miles away from their colony, according to Extension apiculturist Eric Mussen of the UC Davis Department of Entomology. She's just one bee of about 60,000 in the colony. And now, she will not return. She may have eaten something she shouldn't have or may have an intestinal infection, surmised Mussen. Or maybe she was poisoned by a pesticide, snagged by a bird, bitten by a spider, or ravaged by Varroa mites. 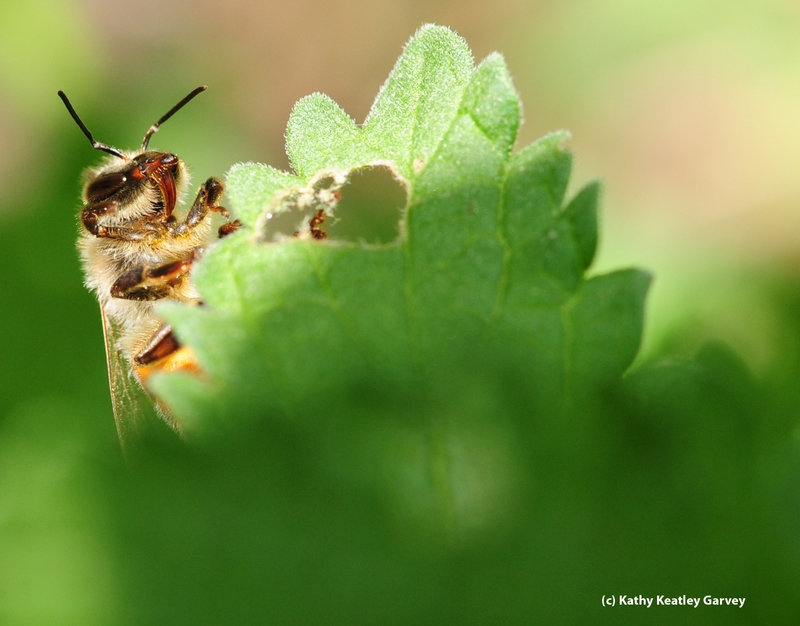 Still, seeing a honey bee tumble off a blossom and die is something we humans rarely observe. Meanwhile, her sisters keep working the blossoms, tasks needed to keep the colony alive. Back at the hive, the queen bee is busily laying about 2000 eggs a day to replace all the adult bees who die every day.